This paper shows how Dooyeweerd’s aspects of reality are related to Goudzwaard’s notion of idolatry and discusses how Dooyeweerd’s aspects contribute to the understanding of idolatry as a cause of problems in e-government. NOTE: This paper is a description of ongoing research. Work on the paper could not be completed because of family commitments and the authors request that it should be treated as ‘work in progress’. The authors would also like to express their apologies for any lack of clarity in the paper. In relation to IS projects and particularly, e-government projects, several problems have been noted. Some researchers have identified idolization or idolatry of technology as a potential cause of the problems (Gauld & Goldfinch 2006; Heeks 2006). However, what idolization is has not been clearly explained. Krishnan Harihara & Basden (2008) developed Goudzwaard’s notion of idolatry to account for many of the problems in e-government projects that are related to idolization, and this gave precision of thought. Krishnan Harihara & Basden (2010) extended this by arguing that each element can take on a positive form, which is valid and may be expected to be present in successful projects. 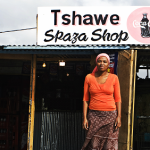 This made Goudzwaard’s notion of idolatry more complete as a tool with which to study e-government, relevant to both success and failure, but the tool was not operationalized. 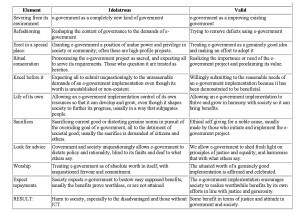 The current paper operationalizes the notion of idolatry, using Dooyeweerd’s (1955) notion of aspects, so that e-government projects and literature about e-government can be critically evaluated. * Ignore: ICT is not seen as part of the reform agenda. Even when computers are available, they remain unused. * Isolate: the procurement and deployment of ICT the sole responsibility of the technical staff. 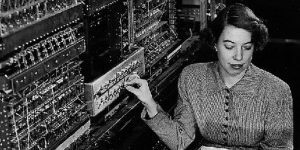 * Integrate: understanding the potential of ICT, tempered by recognition that ICT can at best play a secondary role. * Idolise: structuring the reform process around ICT. ICT forms the core of the business of government. We see this in the vision embodied in the term ‘transformational government’. Heeks warns that wherever an attitude of idolisation is noticeable, the possibility of failure is very high. Though he gives some examples, he does not discuss the nature of idolisation. * An idol is an end that “indiscriminately justifies every means” (p.23). Increasingly, the means chosen are ones we would not normally agree with. * The idol “creates its own false enemies. The ideology declares anyone a traitor who because of his position or past forms an obstacle to the goal” (p.25). * “Worship brings with it a decrease in their own power: now the god reveals how they should live and act” (p.21). “Soon, however, they become dependent on their own creation. No wonder: having given the creation its own life, it has a grip on them” (p.22). * Basden (2008, p.332) adds that an idol delivers the opposite of what it promises. 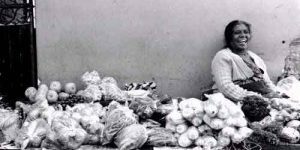 As a result of all these, Goudzwaard says, the earth suffers (p.48), and in particular, “The poor developing countries are hit the hardest by the economic spiral” (p.90). 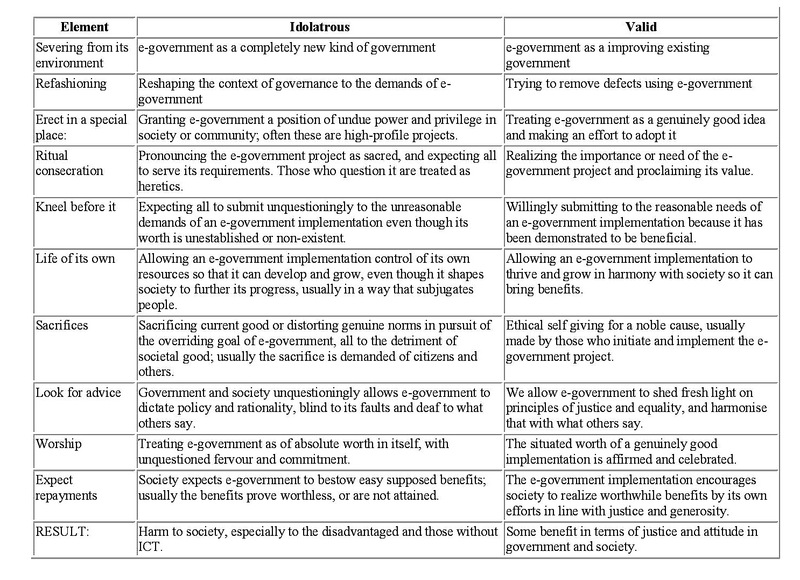 Goudzwaard’s characterization of idolatry contains ten elements, which are reinterpreted by Krishnan Harihara & Basden (2008) in the context of e-government. 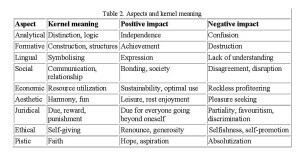 Krishnan Harihara & Basden (2010) argue that each element can take on a positive form, which is valid and may be expected to be present in successful projects. For example, in any innovation something is likely to be sacrificed, so the question is shifted to the motivation for, and nature of the sacrifice. Table 1 shows the elements and their idolatrous and valid forms. Krishnan Harihara & Basden (2008, 2010) link these with extant academic literature and with reports of professional experience, and in (2010) examine three cases in detail. This makes Goudzwaard’s notion of idolatry more complete as a tool with which to study e-government as a whole rather than only its failures. But questions remain. How can we use the elements above in practice to evaluate existing projects, critique proposals and plan for e-government? Are all the elements important? Why (not)? How do we know when and whether to ignore some? It is difficult to see how the above understanding can address those questions. It is necessary to understand each element more deeply, especially what it offers to the process of idolatry and why and when it is necessary. Goudzwaard’s work was influenced by Dooyeweerd’s (1955) philosophical work, in particular its recognition of the religious root of all human activity. By ‘religion’ Dooyeweerd means “the innate impulse of human selfhood to direct itself toward the true or toward a pretended absolute Origin of all temporal diversity of meaning” (1955,I,p.57). This innate impulse pervades and affects all we do and are at a deep level; this is why idolatry has a deep effect on e-government and other projects and implementations. Religion in this sense is not confined to formal creeds, but refers to commitment and deep firm belief about who we are and what is most important. From this perspective, both idolatry and its positive counterpart (e.g. commitment to the good) are primarily pistic functioning, but idolatry is dysfunction that harms while positive pistic functioning brings good. 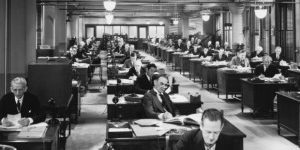 Our functioning in later aspects depends foundationally on that in earlier ones, but it gives meaning and direction to our functioning in earlier ones. So, for example social functioning largely determines how we use language. So our pistic functioning affects all earlier aspects. Thus whether our pistic functioning in e-government is idolatrous or positive will affect our attitudes, our practice of justice, our view of harmony and fun, our economies, our interaction with people (e.g. citizens), our communication, our planning, our clarity of vision, and so on. To Dooyeweerd, all human activity exhibits all aspects, though usually one aspect predominates. For example in writing, the lingual aspect predominates, but there are also a social and aesthetic aspects (taking account of for whom we write, and the style of writing). Idolatry or its counterpart, though primarily pistic, also involves functioning in the other aspects. The elements of idolatry might then be seen as qualified by different aspects as part of this. Therefore we employ Dooyeweerd’s aspects to understand the elements more deeply. To apply aspects to elements of idolatry, we ask what makes the element meaningful as part of idolatry or its positive counterpart. From the analytic aspect onwards, there can be both positive and negative. Table 2 shows the positive and negative in each aspect from the analytic aspect onwards; for more detail see Basden (2011). Each element is analysed with respect to which aspect is most meaningful in its positive and negative versions. Elements of idolatry can exhibit aspects in two different ways – the same aspect for both the positive and negative side; different aspects for the positive and negative sides. In some cases, more than one aspect applies for the positive and negative side. The positive side of severing is stressing the difference of the concept from its origins in the sense that it is a change for the better. There is no carving out of a new entity. Instead, the unsevered whole has the potential to come out of a previously subjugated state. This indicates the analytical aspect. Basden (2010) stresses that the kernel meaning of the analytical aspect is ‘distinction’. Distinction indicates independence. Such independence, Basden (ibid) says, enables us to undertake theoretical thinking so that we are able to conceptualize something as being distinctively meaningful. Such independence does not indicate absolute autonomy but conceptualization and reasoning. In relation to e-government, this enables us to understand that it is a beneficial change attained through selectively using ICT to meet governance objectives, and not a new entity plucked out of ‘old’ (non ‘e’) government. The negative side of severing is a deliberate decoupling of the entity from its origins. It involves shunning and decrying the original, while glorifying the new decoupled form. The original is shunned not because it is inherently bad but because of hubris. Similarly, the glorification of the new decoupled form is not because it is inherently good (which it could be, but that has not been examined), but because of a fascination for it. This also indicates the analytical aspect. But the analytical aspect is here combined with the lingual activity of changing the terminology and language. In relation to e-government, this can be clearly seen. Often, the use of terms such as transformational government in relation to use of ICT indicates severing, and thus idolatry. In the positive sense, refashioning is reforming a concept or system to get rid of its defects and inadequacies. This indicates improvement and innovation. At the root of this aspect are human activities such as designing, implementing structures and improving (Basden, 2010). So refashioning in the positive sense is formative. Basden (2010) opines that the good of this aspect offers the possibility that technology could help alleviate some societal problems. In relation to e-government, deploying ICT might help improve governmental functioning and could bring some positive change, but for that to happen there must be reform of the whole system of governance. That would indeed be beneficial. Refashioning is negative an idolatrous when the context is changed to suit the newly carved out entity. This is also a formative function, but a negative formative functioning. In relation to e-government, this is changing governmental tasks and administrative practices to suit new technology led government. Basden (2010) quotes Schurman (1984) who argues that technology should not be guided by its own norms, which is undesirable. When governments become so technology focussed that, they drastically change ‘old’ government much to the detriment of the citizenry. The positive dimension to erecting in a special place is treating a genuinely good idea as unique and special. This involves making a well considered distinction between that idea and others. This is analytical functioning. In positive erect in a special place, we see the analytical aspect in two ways; one, on the separating out of the ideal from its surroundings and also in the examination of the worth or value of the idea, which leads us to grant it a special place. In the negative sense, erect in a special place is granting the severed idea or entity a position of power and privilege that it does not deserve. This indicates the juridical aspect working negatively. The juridical aspect opens up the possibility of granting some what is due to it. But that doesn’t necessarily involve granting that which is not due at the cost of not grating what it due to others. This is negative juridical. Governments focussed on e-government and the rapid deployment of ICT grant technology such importance that other important issues in relation to organisational factors and some of the adverse impacts of ICT deployment is often ignored. Positive ritual consecration is realizing the importance of something and declaring or proclaiming its value. In practice, we see ritual consecration in statement or announcements about the idea; the setting of starting points and in the formal commencement of an activity. This formal activity is symbolic, but an essential preface to what follows and what led to it. This indicates the lingual aspect. In relation to e-government, consecration could be a positive thing if it means public proclamation or formal initiation of a system to further a genuinely beneficial goal. Negative ritual consecration involves glorifying the idol, combined with castigating those who do not serve it. There are pronouncements about the importance of the idol and why it ought to be served. This is can be seen operating in the prestige ICT projects initiated by some governments. The commencement of such projects are marked by public announcements about how beneficial these projects would be and why they should be accepted and adopted by society. The announcements also declare why resources ought to be diverted from other areas to this project. Anyone who questions the value of the projects is declared as being against progress and development. Thus, negative ritual consecration is also a lingual function. In the positive sense, this involves submitting to the demands of a noble cause. That means the value of that cause is thoroughly accepted and this brings about the commitment to that cause. This is pistic functioning. There is deliberate acknowledgement of the value of that cause, and that determines what actions are taken. In the negative sense, kneeling is both a declaration and an acceptance of the idol’s holiness. This is a kind of unquestioned and undesirable submission. It is accepting the mastery of the idol over us, much like slavery to the idol. Anything having a life of its own means it is self-sustaining. On the positive side, where society has accepted the importance of an entity and its value there is the voluntary commitment and provision of resources to that cause. The granting of such resources is done without grudge. This is juridical functioning. The kernel meaning of the juridical aspect is meeting the the requirements of what is due. In relation to e-government, we see this in operation in the allocation of funds, appointment of personnel for the projects and the dedication of time and effort for realizing the project. Life of its own operates negatively when the idol makes itself self-sustaining by usurping the resources it needs. The steps leading to the idol attaining a life of its own has such an influence on its followers that the idol is now in a position to demand any resources it needs and society grants it unquestioningly. In this manner, the idol is able to determine its own course of development. The idol thus begins to shape society in such a way it is able to progress, which might be in such a way the rest of society might be disadvantaged. If in pursuit of a noble cause, one were to make sacrifices it deserves appreciation. Such sacrifice could be in the form of granting resources and putting in effort in service of the cause. Such dedication of resources often exceeds the minimum resources needed for the project and may involve the diversion of resources from other activities and areas. This indicates ethical functioning. Baden (2010) explains that the ethical aspect presents the possibility of ‘extra goodness’ and going beyond the requirements of the juridical aspect. Functioning in the ethical aspect includes being hospitable, generous and good even at expense or disadvantage to ourselves. Idolatrous sacrifice is often forced upon others. Such sacrifice involves renouncing giving up the good in service to the idol. In idolatrous sacrificing, the followers of the idol may cause much suffering and pain to themselves and to rest of society. They might do this without even realizing the impact of making such sacrifices because of the hold the idol has on them. Thus, the idol causes the bad to happen. This indicates negative juridical. Basden (2010) says the juridical aspect operates negatively when we see partiality and injustice. This we see in operation in idolatrous making of sacrifices. Looking to something for advice is a positive thing when the entity is allowed to shed light on good principles. When this happens, policy is set around the noble cause because it helps achieve justice, peace and prosperity for everyone in society. In relation to e-government, this would mean the government listening to society to understand what society needs (and asks for) and working towards achieving it. The government listening to society is giving what is due to it. This indicates the juridical aspect. Looking to something is a retrograde step when we unquestioningly allow the entity to dictate what we ought to do. Here the idol dictates not only what society ought to do in its service, but also how to conduct life in general. This means that commitment to the idol has blurred our logic and we do not examine the good and bad of the advice granted to us by the idol. Blurring of our logic indicates the lingual aspect, functioning negatively because commitment to the idol prevents proper understanding. When we uphold the value of a noble cause and are committed to it, this is a positive step. Commitment indicates the pistic aspect. Hosman (2010) describes the case of a school in Uganda which was committed to providing computer training and improving the ICT skills of its pupils’. The school was able to successfully set up a computer lab for this purpose, despite constraints such as lack of adequate funding and unreliable power supply. Such commitment to a noble cause without any idolization of the technology itself brings about positive change. The negative side of worship is absolutization of the cause. So commitment to the cause is not in service of a further greater good because an end in itself. In doing so, we resist what is good and noble. Here too, there is commitment. But the commitment is akin to absolutization and indicates the pistic aspect working negatively. This paper has so far shown how Dooyweerd’s aspects are related to Goudzwaard’s notion of idolatry. In doing so, this paper has sought to further one’s understanding of how idolatry operates in relation to ICT and e-government, in particular. This analysis of idolatry is important because it shows how the discussion on the problems and failure of e-government may be taken forward. It has already been shown that Goudzwaard’s notion of idolatry provides an excellent explanation of the problems (or negatives) of e-government. That being so, the question arises as to why we need to introduce aspects into this discussion? projects is the lack of idolatry. But we believe that saying that lack of idolatry contributes to success, although quite correct, is only a partial explanation. Bringing aspects into this discussion shows how the positives might emerge through multi aspectual functioning. Thus this paper points to a potential solution to how the problem of idolatry may be overcome. Yet another contribution of this paper is that it clarifies the meaning of the phrases Goudzwaard has used to define idolatry. 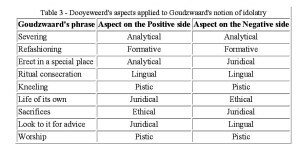 The authors believe that the ideas presented in the following table could not have been arrived at without referring to Dooyweerd’s aspects. This paper makes a number of contributions. First, it adds to Krishnan Harihara & Basden (2010) by showing how idolatry explains the negatives or problems in e-government. 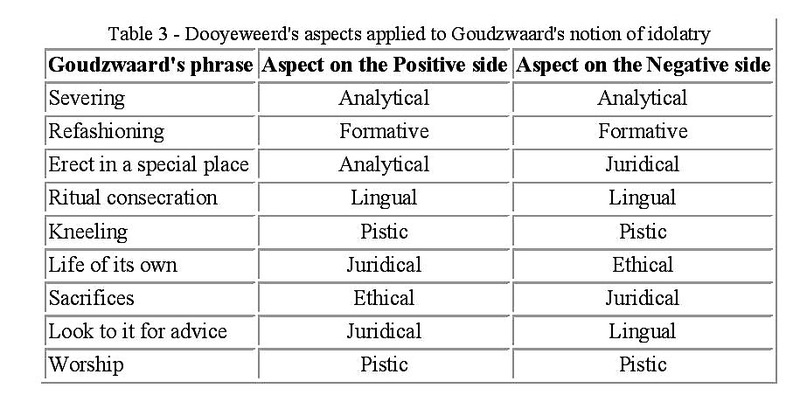 It also clarifies the meaning of each of Goudzwaard’s phrases by using aspects. Finally, it shows how Dooyweerd’s aspects enrich the discussion on idolatry in relation to e-government because of its ability to explain both the positives and negatives side of e-government. Basden A. (2008) Philosophical Frameworks for Understanding Information Systems. Hershey, PA, USA: IGI Global (IDEA Group Inc.). Basden, A (2011) ‘Presentation of Herman Dooyeweerd’s Aspects of Temporal Reality’ – International Journal of Multi-aspectual Practice, 1(1). Dooyeweerd, H. (1955). A new critique of theoretical thought (Vols. 1-4). 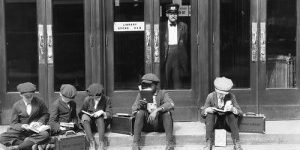 Jordan Station, Ontario, Canada: Paideia Press. Gauld R. and Goldfinch S. (2006) Dangerous Enthusiasms: E-Government, Computer Failure and Information System Development. Otago University Press, New Zealand. Goudzwaard B (1984) Idols of Our Time. Inter-Varsity Press, Illinois, USA. Krishnan Harihara, S &. Basden, A. (2009) Understanding failures in e-government: Idolatry as a lens. In: Basden, A, Eriksson D, Strijbos, A. (eds.) The Problem of System Improvement: Proceedings of the 13th and 14th Annual Working Conference of the CPTS. Maarssen, Netherlands. ISBN: 978-90-807718-6-4. Krishnan Harihara, S. & Basden, A. (2010). Is idolatry a suitable tool to test e-government? pp. 107-125. In: Goede R, Grobler L, Haftor DE (eds.) Interdisciplinary Research for Practices of Social Change. Proc. 16th Annual Working Conference of the Centre for Philosophy, Technology and Social Systems (CPTS), 13-16 April 2010, Maarssen, Netherlands. CPTS, Maarssen; BZ Repro, Haaksbergen, Netherlands. ISBN/EAN: 978-90-807718-8-8.